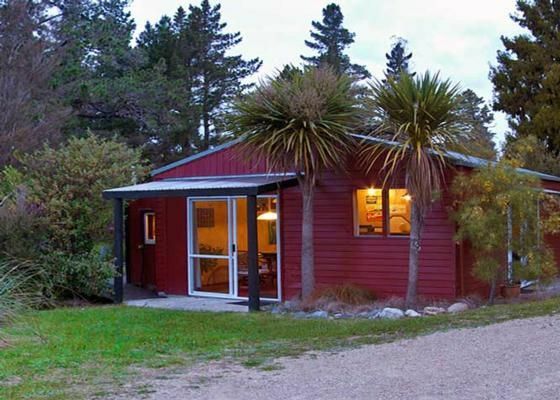 Nestled in the foothills of the Kahurangi National Park and centrally located in beautiful Golden Bay, the Laidback Lodge offers the privacy and peace you want from a holiday experience. Enjoy the enchanting sounds of birdsong, the wind blowing gently through the Rimu and Eucalyptus trees, or your favourite music playing on a top- notch stereo sound system. An outdoor bush bath under a starry sky or how about an easy walk to the world renowned Mussel Inn, famous for its boutique beers, delicious meals and live music. Two kilometres or an easy three minute drive, will get you to Onekaka Beach, once the sight of the Onekaka Wharf, where iron ore from the nearby hills was shipped off to distant locations. The remains of this iconic wharf can still be seen. The Laidback Lodge is located on Ironworks Road, across the main highway from the old settlement schoolhouse, which is now our little community hall, complete with a tennis court! The Laidback Lodge consists of three components: the Main Cottage has the kitchen, lounge and dining areas, a king size bed, and the bathroom/toilet. It's fully insulated and stylishly decorated in a funky bach sort of way. It gets all day sun year round. The "Kiwi Caravan" is a classic 50's style caravan which has been converted to a cozy bedroom with a double bed. It's attached to the deck, under cover, very funky, amazingly warm in winter and cool in the summer. "The Bunkhouse" is fully insulated and just big enough for a bunkbed. The kids will love sort of like "camping out" in the yard! There is also a large grassy area with a mountain view, perfect for games, or tents for larger groups. Of course, every structure has a TDC building permit. All are warm and cozy in winter, with heating and extra blankets provided. There's also an extra refrigerator/freezer in the barn. The Lodge is ideal for a romantic getaway, a quiet retreat, a shared holiday with friends, or a rambunctious family vacation! Two night minimum stay or a one night surcharge will apply. This charge is dependent upon number of guests/season. High season: two guests one bed = $15 charge. $6.50 per person. Minimum stay of five nights from 28th of December to the 3rd of January with a minimum of four guests. There is a shallow pond further up on the property (out of sight), so parents need to keep on eye on their children if they are inclined to wander. A large grassy yard area for play, a hammock in the rimu grove, or how about a wood fired bush bath!